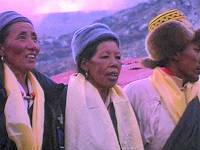 The Sherpas' Song by Chris Walpole got a 4-star award at BIAFF 2009. I used to enter Super-8mm films in IAC competitions in the 1980s but ever since I retired 12 years ago I seem to have had less time to spend on film-making instead of more. I worked for 20 years as the manager of a team of nautical chart compilers at the Hydrographic Office in Taunton, producing charts of the Mediterranean, Pacific, Middle East and Antarctica. I only got to sea on a survey vessel once, but that was a memorable trip to St Kilda in 1978 where I shot some cine film of the famous abandoned settlement and being dive-bombed by angry great skuas. Projects from those days (some unfinished, some seen just by me and a few other unfortunate folk) included Fools Gold (a Western filmed on Dartmoor), Half Life (an anti-nuke mutant monster movie), The Hairy Hands (a horror about a haunting on Dartmoor), and Start Anew (starring me and Bob Dylan). My best cine films were probably Autumn Ending and The Ice That Gleams, abstract shorts of leaf and ice patterns respectively, and Real Estate, a cradle to grave film shot entirely in slow motion from a moving car with people symbolically acting out their hobbies in front of their estate houses. This latter film won a Gold Seal award at the 1991 IAC International Film and Video Festival. I've always kept the camera turning at village events (I've lived in Belstone on the edge of Dartmoor since 1963) and in 2002 I edited all that local footage into a three hour video which accompanied The Book of Belstone, a parish history which my wife Marion and I wrote as a millennium project. To date we've sold 270 copies of the video and 470 books, raising £8000 for the Village Hall. I've done a fair bit of travelling lately with film shot in Ecuador, Madagascar, India and Costa Rica all waiting to be edited. Currently I'm working on Las Islas Encantadas, which will be about Darwin (or at least a cardboard cut-out of the great man) in the Galapagos Islands. It's hard to think straight at almost 5000m especially when you're suffering from altitude sickness. But when a group of Sherpas started singing and dancing a strange shuffling dance in the clear evening light right under the great 3700m south face of Lhotse I knew this was something special to film. 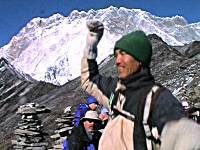 I was on a 24 day trek over three of the high passes close to Everest. I knew the spectacular mountains would offer lots of filming possibilities and sure enough I returned home with over five hours of footage which I edited into a conventional hour-long travelogue. I had also taken with me three gorilla masks with the thought of making a serious yeti film but, like many of my unscripted ideas, the resulting footage was ridiculous and not even fit to be a comedy. 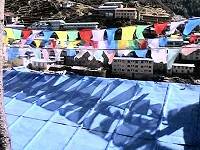 But in amongst all the film of Westerners plodding along and gasping for breath were snatches of Sherpa life which I realised would make a much more interesting short film. The sounds came first. The impromptu singing and shouting; grunts and groans as loads were lifted onto backs; the music of yak bells; prayer flags catching the wind and prayer wheels turning with water power; children laughing on their way to school; a chorus of hammers as stone-masons shaped granite lumps into building blocks; a Sherpa singing for the camera with Everest over his shoulder. All it needed was the greeting Namaste ('Hello') for almost all the locals to be at ease with the camera pointed at them. 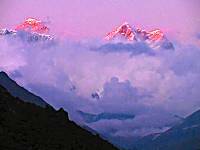 So The Sherpas' Song evolved as a tone poem - a love letter if you will - to the people of the Khumbu, its eight minutes structured to be a dawn to dusk picture of their lives. I used a Panasonic DX110B digital camera which performed faultlessly, whether in dusty close-ups of passing yak trains or in afternoon snow flurries. I was lucky with the sounds - it was hardly ever windy so the in-camera microphone which was all I used was adequate. Years ago I used to carry a large tripod up Scottish mountains but those days have gone - on this trip my most useful accessory was a beanbag which gave instant stability on all types of terrain. 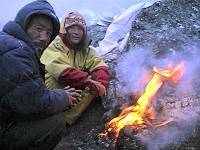 I had two main worries - not being able to charge the batteries at the highest settlements and that the extreme cold (down to minus 15C overnight in our tents) would seriously lessen their life. In the event the guide books were out of date - it was possible, for an ever-increasing price the higher we climbed, to plug in to the power in lodges all the way up to Lobuche at 4930m. And by cuddling the camera all night inside my sleeping bag I was able to keep it going all the next day. I edited the film on a basic model Casablanca, overlapping the sounds where appropriate and cutting the static mountain shots to the rhythm of those shuffling feet.